Whilst many organisations are switching to cloud based technologies such as SAP SuccessFactors, some organisations are either unable to move to cloud or want to maximise their investment in their ‘on premise’ solutions before moving to cloud solutions. SAP still provides a powerful suite of ‘on premise’ HR and Payroll solutions to meet customers’ needs, with an enhanced user experience (with HR Renewal, for example) to ensure that these organisations can continue to reap the benefits of this solution. Gavdi and SAPs relationship extends over 20 years and this combined experience and commitment to global HR and Payroll rollouts brings significant benefits. Gavdi has an experienced team of SAP trained and certified professionals, with an average of over 12 years SAP experience, who are able to quickly understand what needs to be done and deliver value early in the implementation. Business execution (aligning business goals to people goals and executing these through ‘best of breed’ Talent Management solutions). Time Management enables organisations to effectively and efficiently plan, record and maintain all aspects of their time data – from the input of timesheets (where appropriate) to the management of holidays, maternity/paternity/adoption leave and sickness absence. SAP Time Management has user-oriented interfaces that support centralised and decentralised entry and administration of time and labour data. Data can be processed centrally by administrators in the human resources department or in individual departments by dedicated time administrators, including employees themselves. SAP Time Management enables organisations to record time and labour data online or by using self-service applications. These self-service applications range from the classic time recording subsystem, web applications and mobile business applications. Employees can use these applications to request leave, record working times for orders or projects, for example, and display their key time accounts. Time Management permits organisations to represent all company agreements, collective agreement stipulations, and legal requirements the world over. Gavdi has implemented Time Management to some of the world’s largest organisations and we pride ourselves in our ability to support all types of deployment – from the simple and most straight forward, to the most complex requiring interfaces to external 3rd party solutions and sophisticated shift planning and integrations to SAP Payroll. Gavdi has an unrivalled expertise in deploying SAP Payroll, which has recently extended to Employee Central Payroll, SAP’s cloud version of its award winning payroll engine. This payroll solution is a sophisticated, powerful product with full tax compliance and approval for each country that it serves. It has comprehensive Retroactive Accounting functionality, in addition to sophisticated data validation functionality. Employee transfers across the organisation are supported without the need to end the old employee number and use a new employee number for payroll. The same employee number will be used. The remuneration statement engine will be used to generate payslips from payroll results. These can be viewed online, printed, or both. Gavdi is able to help organisations to deploy and/or maximise their SAP ‘on premise’ investment. 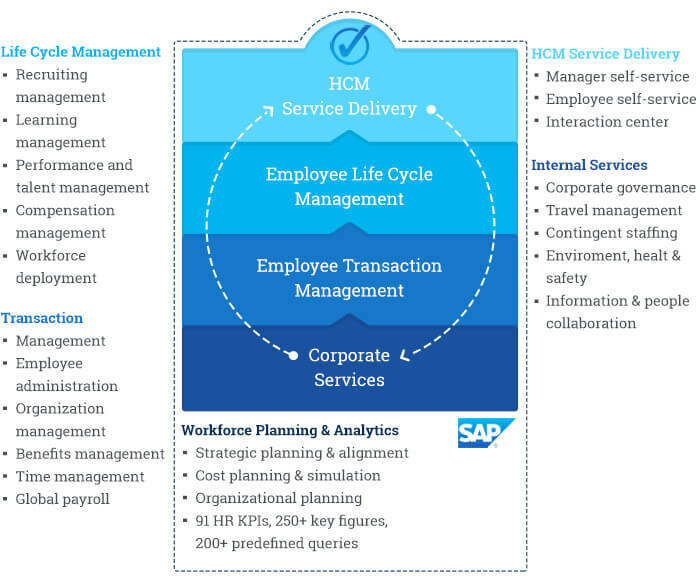 We can also, over time, assist organisations with a transition to cloud – either fully using the SAP SuccessFactors HCM solution or through tactical deployments of individual modules.